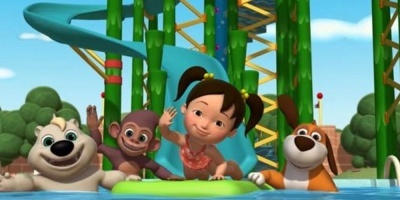 This is the third Chinese lesson for kids from our online “Learn Chinese for Kids” series on Bilingual Kidspot hosted by Miss Panda Chinese: Learning Chinese colors. 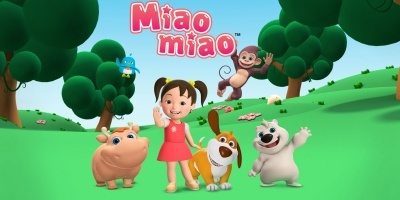 If you are a parent or teacher trying to teach kids Chinese make sure to keep following this series! 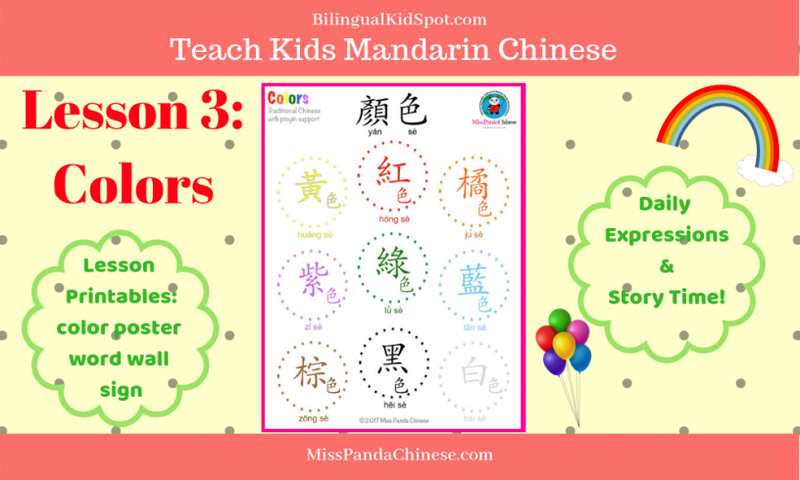 Welcome back to another playful class for Mandarin Chinese with Miss Panda! Nǐ hǎo 你好 ! You now have a basic understanding of Chinese language. We have talked about the Chinese tones, the writing systems, and many surprising facts about Chinese language in the Introduction article with the Chinese Starter Kit. We also touched on how to set up your bilingual home with visual tools that you can display around your house. Do you have a Chinese Word Wall by now? The last Chinese lesson was with Chinese numbers and counting. 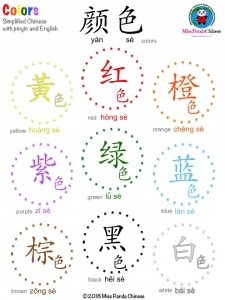 This time we are going to talk about colors in Chinese! 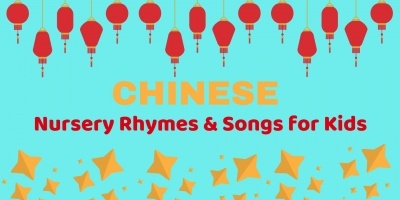 After this class you will know the Chinese colors and be able to connect numbers and counting with colors with the Chinese language. Make sure to download the printables at the end of the post! Language and culture go hand in hand. 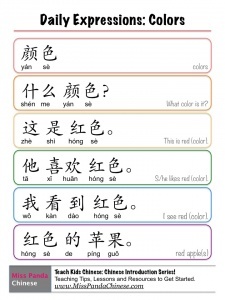 When we talk about colors in Chinese there are a couple of fun facts that we can introduce to children. Red is a lucky color for Chinese. Red is the color Chinese people use for wedding, birthday celebration and festival displays. Do you know there is a special color for Chinese emperors? Yellow was the emperor’s color in ancient China. 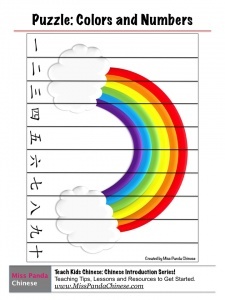 Colors of the Rainbow rhyme is a great way to teach and learn the basic colors in Chinese. However, color words can be also used without the “color” word at the end, just like in the rainbow color rhyme. There are games like “I Spy” and “Music Chairs” that work very well with this color lesson. You can read more in the Teaching Tips page. I cannot emphasize enough about visual display in your home or in a language classroom, especially when teaching Chinese colors. Word signs, word walls and posters are providing a text-rich target language environment for children. This time I have a color poster with pinyin and English support for you to add to your Chinese Word Wall. In the number and counting lesson we use the expression “I see…”. Now, you can use it for colors. In this lesson I have five sentences that you can use any time of the day when want to have some fun with colors! Use them for “I Spy” game as well. They are: What color is it? This is ____ (insert color). S/He likes _____. I see _____. Red apple(s). These expressions are used all the time. You can print them out and post it on your Word Wall. It will come in handy. This is always my students’ favorite part. Kids of all ages enjoy hands-on learning experience. When children touch, feel, see, hear and make. They are in! They are in the target language. They are acquiring the language. Children can use crayons, markers, finger paint to decorate the bookmarks according to the color of each design. Use cello sheets. tissue paper, washi tape, or recycle gift wrapping papers to create various balloon design on the bookmarks. You can even create 3D style bookmarks. Use cotton balls and lightly dip them in different color paint. Glue the colored cotton balls to the balloons. Color Match Cards This game can be as simple as you want with just one set of two pages of color circle cards. The more you sets you have the more exciting it goes. Use one set as the anchor cards. For young players, a parent can call the color card in the child’s hands first and then the child/player place the card on top of the matching anchor card. For older kids, they can call the color card themselves and place the cards on the anchor cards. Have a blast! Rainbow Puzzle Put it all together. Here you have numbers and colors. What number do you see? What colors do you see? Where are The Colors? This is a story with all the colors you see in the color poster. Can you spot all the colors? Can you spot all the stars? 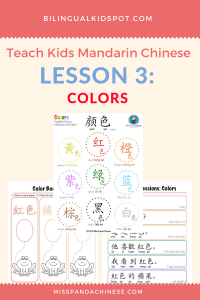 Teach Kids Mandarin: Chinese colors –download printables here. I hope you have a lot of fun with this session. Leave a comment and let Miss Panda know your child’s favorite activity in this lesson.